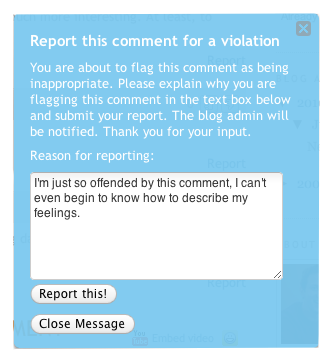 One of your Comment Settings is the option to activate a “Report” button giving your readers the option to report offensive comments and help you keep the comment section clean. This option is located in your Comment Settings page. You can customize the pop-up message the a user will see when they select the Report button, and they will have the option to type in a few words on why their reporting the comment. You will receive an email notifying you that the comment has been reported and you will be able to proceed as you’d like, whether you choose to remove the comment or leave it as is. 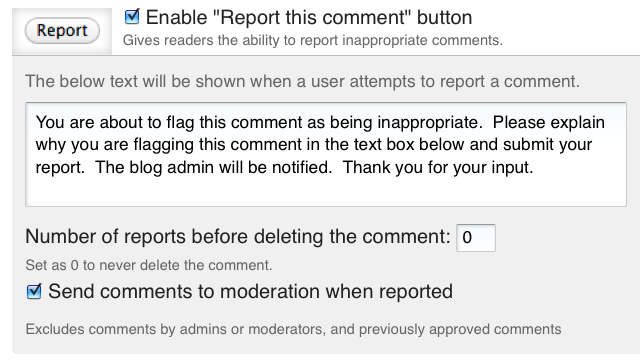 You also have the option to set the maximum number of times a comment can reported before it’s automatically deleted. Don’t worry, we restrict the number of times that a single user can report a comment (by IP address), so you don’t have to worry about abuse of this feature.